A mystery monkey is roaming freely through the trees around Tampa Bay, Florida -- but this isn't the first time this has happened. In October, animal control officials captured a rhesus macaque monkey that had been wandering the area for approximately four years. The earlier monkey attracted national media attention, appearing on the Colbert Report, and has a Facebook following with over 85,000 likes. The Tampa area's new monkey does not yet have a social media presence. According to area residents, the new monkey also appears to be a rhesus monkey and avoids contact with humans. 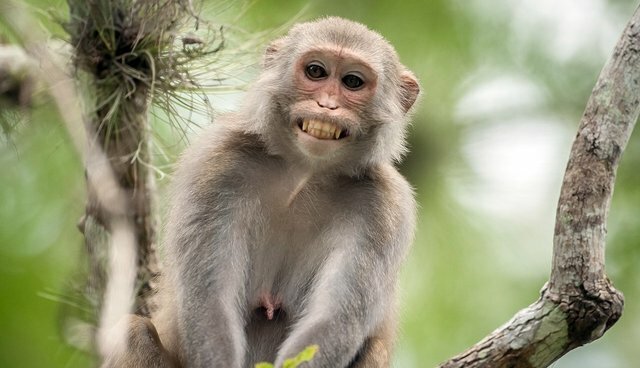 The monkey has been spotted most frequently at Apollo Beach, and officials suspect it made its way to the area from a rhesus colony in Silver River State Park, near St. Petersburg, or from an owner who did not have a permit for the animal. Locals have been warned not to feed, play with, or attempt to house the monkey, although a local news outlet has reported that area residents seem more than content to leave the monkey be.